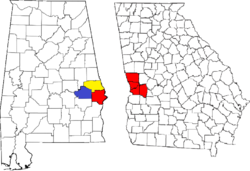 Russell County is a county in the southeastern part of the U.S. state of Alabama. As of the 2010 census, the population was 52,947. Its county seat is Phenix City. Its name is in honor of Colonel Gilbert C. Russell, who fought in the wars against the Creek Indians. 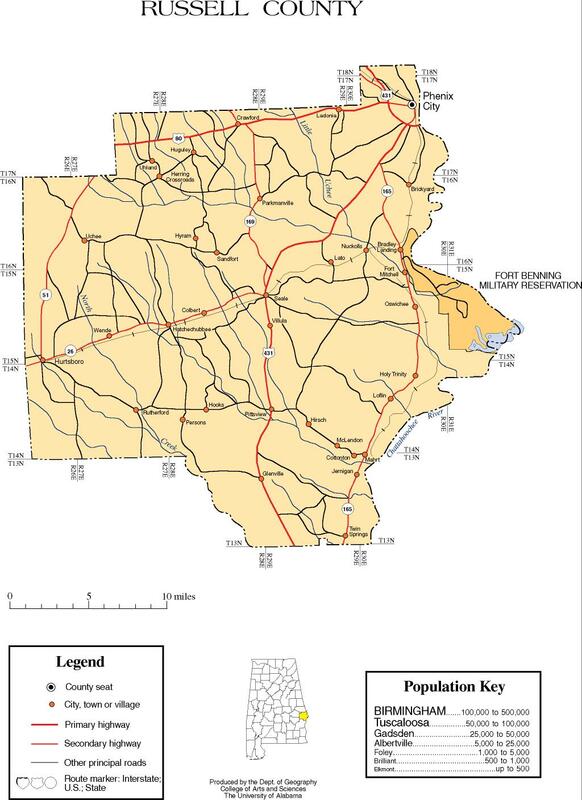 Russell County is part of the Columbus, GA-AL Metropolitan Statistical Area. Russell County was established by an act of the state general assembly on December 18, 1832, from lands ceded to the state by the Creek Native Americans. The county seat has changed several times: Girard (1833–1839), Crawford originally Crockettsville (1839–1868), Seale (1868–1935) and Phenix City (1935–present). It was named for War of 1812, Col. Gilbert Christian Russell, Sr., 1782–1861, 3rd U.S. Infantry. According to the U.S. Census Bureau, the county has a total area of 647 square miles (1,680 km2), of which 641 square miles (1,660 km2) is land and 6.1 square miles (16 km2) (0.9%) is water. As of the 2010 United States Census, there were 52,947 people residing in the county. 53.7% were White, 41.8% Black or African American, 0.4% Asian, 0.4% Native American, 0.2% Pacific Islander, 1.3% of some other race and 2.1% of two or more races. 3.7% were Hispanic or Latino (of any race). As of the census of 2000, there were 49,756 people, 19,741 households, and 13,423 families residing in the county. The population density was 78 people per square mile (30/km2). There were 22,831 housing units, at an average density of 14/km2 (36/sq mi). The racial makeup of the county was: 56.69% White, 40.84% Black or African American, 0.37% Native American, 0.36% Asian, 0.07% Pacific Islander, 0.59% from other races, and 1.07% from two or more races. Nearly 1.50% of the population were Hispanic or Latino of any race. There were 19,741 households, out of which 32.00% had children under the age of 18 living with them; 44.40% were married couples living together, 18.90% had a female householder with no husband present, and 32.00% were non-families. 28.00% of all households were made up of individuals, and 10.60% had someone living alone who was 65 years of age or older. The average household size was 2.49, and the average family size was 3.05. In the county, the population was spread out with 26.50% under the age of 18, 9.10% from 18 to 24, 28.80% from 25 to 44, 22.40% from 45 to 64, and 13.10% who were 65 years of age or older. The median age was 35 years. For every 100 females, there were 91.00 males. For every 100 females age 18 and over, there were 85.90 males. The median income for a household in the county was $27,492, and the median income for a family was $34,004. Males had a median income of $28,696 versus $20,882 for females. The per capita income for the county was $14,015. About 16.80% of families and 19.90% of the population were below the poverty line, including 26.50% of those under age 18 and 19.30% of those age 65 or over. Russell County trends Democratic in presidential elections; having last supported a Republican in 1972 when it voted for President Nixon. President Bush came within 38 votes of carrying the county in 2004. James Abercrombie, United States Congressman from Alabama, resided here. ^ a b "State & County QuickFacts". United States Census Bureau. Retrieved May 17, 2014. Russell County map of roads/towns (map © 2007 Univ. of Alabama). This page was last edited on 10 March 2019, at 06:53 (UTC).